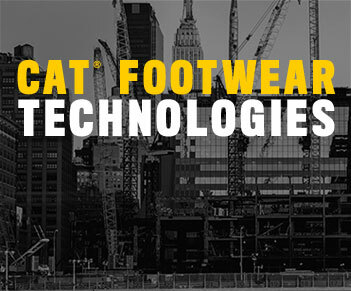 At Cat Footwear, we believe in building a better future in our community, and with the start of a new year, we want to bring you along with us. Which is why we are encouraging your workplace, community, office space to share with us how you are building towards a better future. Back on October 6th, Cat Footwear hosted our first Build for Better, an event aimed to give back to the Chicago community and also celebrate our sponsorship of the IG Builder’s Challenge that kicked off that month. 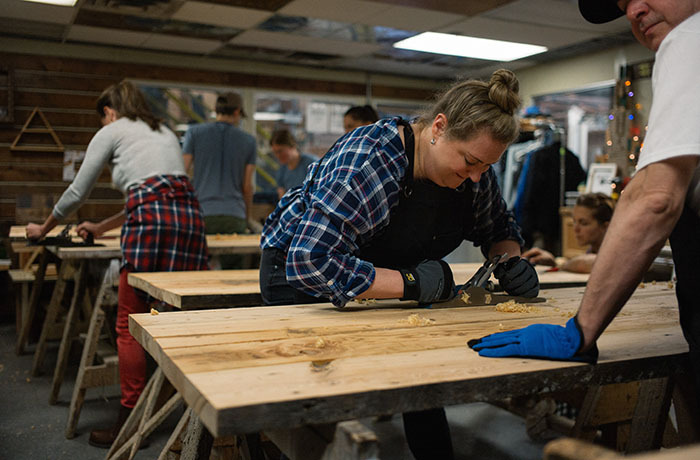 We hosted the three co-founders of the IG Builder’s Challenge and invited the community to come out for free desk building workshops to the ReBuilding Exchange in Chicago, a non-profit that diverts building materials from landfills by repurposing and selling used goods. 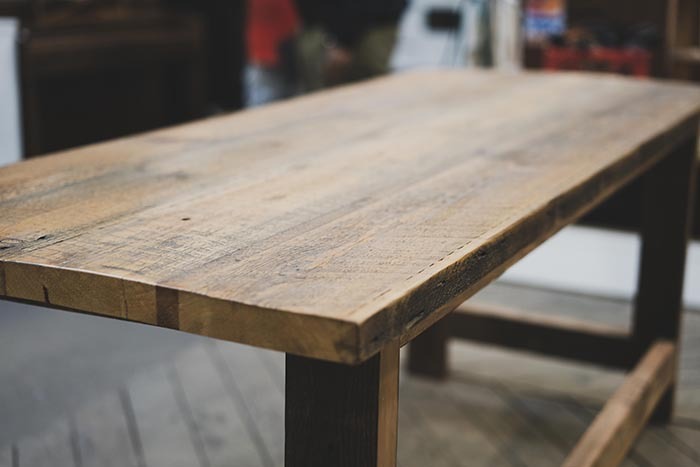 By the end of the day, together we had built 12 handmade wooden desks with re-claimed wood that we donated to Designs 4 Dignity, which helped to transform nonprofit Enlace with new office space makeover. 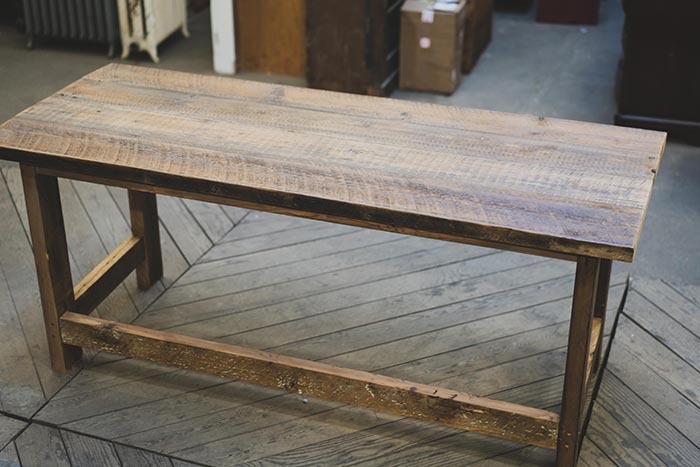 We had an extra, handmade, reclaimed wooden desk made from the staff at Rebuilding Exchange and are now giving it away to a deserving office space or community that is helping to make a difference. On Instagram using the hashtag #HowWeBuildforBetter, share your story or your workplace’s story on how the space you work or live in is making a difference to be entered for a chance to win the desk. Or you can also enter to win with just your name, email and your thoughts on how to make the world a better place. At the end of February, we will be choosing a deserving winner. Watch the full length journey of Build for Better here. Please read these Official Rules carefully before entering the “Desk Giveaway” Sweepstakes (the “Sweepstakes”). By entering the Sweepstakes, you agree that you have read and are bound by the terms and conditions set forth below as if you had signed a written contract. If you do not agree to the terms and conditions set forth below, you may not enter the Sweepstakes. NO PURCHASE NECESSARY TO ENTER OR WIN. A PURCHASE OR PAYMENT OF ANY KIND WILL NOT INCREASE ODDS OF WINNING. VOID WHERE PROHIBITED. 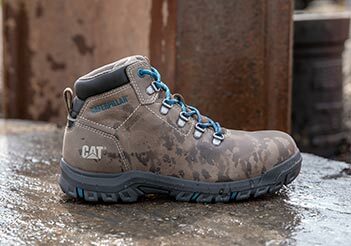 Sponsor: The Sweepstakes is sponsored by Cat® Footwear, a division of Wolverine World Wide, Inc., 9341 Courtland Drive NE, Rockford, Michigan 49351 (the “Sponsor”). No other entity is responsible for this Sweepstakes or the award of any prize. The Sweepstakes Period: The Sweepstakes begins on January 7, 2019 at 8:00 a.m. Eastern Time (ET) and ends on February 28, 2019 at 11:59 p.m. ET (the “Sweepstakes Period”). A clock chosen by Sponsor will serve as the official time-keeping device for the Sweepstakes. Eligibility: The Sweepstakes is open only to permanent legal residents of the United States (including D.C.), excluding Florida and New York, who are at least 18 years old as of the date they enter the Sweepstakes and who enter the Sweepstakes as described in the “Entry” section below. Every such person who enters the Sweepstakes is referred to in these Official Rules as an “Entrant,” “you,” or “your.” Employees of Sponsor, its affiliates, parents and subsidiaries, the Sweepstakes administrator, their advertising or promotion agencies, those involved in the production, development, implementation or handling of this Sweepstakes, any agents acting for, or on behalf of the above entities, their respective parent companies, officers, directors, subsidiaries, affiliates, licensees, prize suppliers, any other person or entity associated with this Sweepstakes and/or members of their immediate families (spouses, children, siblings, parents) and/or persons living in the same household as such persons, whether or not related, are ineligible to enter this Sweepstakes or win. All federal, state and local laws and regulations apply. Entry: How to submit an entry (“Entry”) for the Sweepstakes: Entry Option 1 – Fill out every required field at [http://bit.ly/HowWeBuildforBetter] and submit the electronic form during the Sweepstakes Period. Entry Option 2 – Mail-In Entry: Mail a form with your name, birth date, phone number, and e-mail address to: “Attn: Desk Giveaway, Cat Footwear” at 9341 Courtland Drive NE, Rockford, Michigan 49351 to receive one entry. Entries must be received during the Sweepstakes Period to be eligible to win. All methods of entry will be treated equally, and neither form of entry will be given priority. Any attempted form of entry into this Sweepstakes other than as described herein is void. Drawing: On or about February 28, 2019 Sponsor will hold a random drawing to select one (1) winner of the Desk Giveaway Prize, as defined below. Non-winning entries will not be retained for any subsequent sweepstakes, contests, or giveaways. Each potential winner will be notified by email within approximately two (2) weeks of the drawing. When a potential winner is contacted, he/she will have forty-eight (48) hours to respond to the notification email, or his/her Entry will be disqualified and his/her prize forfeited, and an alternate potential winner may be selected from among all remaining eligible entries. If an Entrant changes his/her email address after he/she registers, it is his/her sole responsibility to update Sponsor. Failure to update registration information may affect a potential winner’s ability to receive a prize. If a potential winner cannot be reached after a reasonable effort has been exerted, he/she is found to be ineligible, he/she cannot or does not comply with these Official Rules, or if a prize or prize notification is returned as undeliverable, such potential winner will be disqualified, and an alternate potential winner may be selected at random at Sponsor’s sole discretion from among all remaining eligible entries. If a winner for any prize cannot be confirmed by March 31, 2019, then the prize will not be awarded. Prize and Odds of Winning: Each winner will be awarded one prize (each prize separately is a “Desk Giveaway Prize”). Each Prize consists of one (1) wooden desk. Approximate Retail Value of each Day 1 Prize (“ARV”): $1000. Odds of winning a prize depend on the number of eligible entries received. Prizes cannot be exchanged, redeemed for cash, transferred, or combined with any other offer and are subject to stated terms and conditions. General Prize Conditions: Additional compensation will not be provided if actual value of any prize received is less than stated ARV. All expenses not specifically mentioned herein, including, but not limited to, any license fees, travel, required installation or requested product upgrades/options, as applicable, are the sole responsibility of each winner. No substitution, transfer or cash equivalent for a prize (or prize component) will be offered, except that Sponsor, at its sole discretion, may substitute a prize (or prize component) of equal or greater value for any reason. Any depictions of a prize or prize elements are for illustrative purposes only. All prize details are decided at the sole discretion and decision of the Sponsor. In the event that a component of any prize is not available for any reason beyond Sponsor’s control, then remaining elements of the prize shall constitute full satisfaction of Sponsor’s prize obligation to winner and no additional compensation will be awarded, except at Sponsor’s sole discretion. Each winner will be solely responsible for all taxes on any prize won. General Release: By entering the Sweepstakes, you release Sponsor, its respective parent companies, subsidiaries, affiliates, directors, officers, employees, and agencies (collectively, the “Released Parties“) from any liability whatsoever, and waive any and all causes of action, related to any claims, costs, injuries, losses, or damages of any kind arising out of or in connection with the Sweepstakes, your participation in the Sweepstakes, or delivery, mis-delivery, acceptance, possession, use or misuse of or inability to use any prize (including, without limitation, claims, costs, injuries, losses and damages related to personal injuries, death, damage to or destruction of property, rights of publicity or privacy, defamation or portrayal in a false light, whether intentional or unintentional), hardware, software or telephone failures of any kind, cost or unavailable network connections, fraud, incomplete, garbled or delayed computer transmissions, whether caused by Sponsor, users or by any of the equipment or programming associated with or utilized in the Sweepstakes or by any technical or human error which may occur in the processing of submissions which may damage a user’s system or limit an Entrant’s ability to participate in the Sweepstakes, whether under a theory of contract, tort (including negligence), warranty or other theory. Disclaimers: Released Parties are not responsible or liable for entries that are entered by other than human means (such as by an automated computer program or any non-human mechanism, entity, or device), in excess of the stated limit, or for entries that are illegible, late, destroyed, lost, misplaced, stolen, misdirected, tampered with, incomplete, deleted, damaged, incomplete, or otherwise not in compliance with these Official Rules, and all such entries will be disqualified. By registering for and entering the Sweepstakes, you agree and acknowledge to be bound by these Official Rules, as well as the decisions of Sponsor which are final and binding in all respects with regard to the Sweepstakes; and to waive any rights to claim ambiguity with these Official Rules. Each Entrant further agrees to indemnify and hold harmless the Released Parties from any and all liability resulting or arising from Sweepstakes and to release all rights to bring any claim, action or proceeding against Released Parties, and hereby acknowledge that said Released Parties have neither made nor are in any manner responsible or liable for any warranty, representation or guarantee, express or implied, in fact or in law, relative to a prize, including express warranties provided exclusively by a prize supplier that may be sent along with a prize. Limitations of Liability; Disclaimer of Warranties: IN NO EVENT WILL THE RELEASED PARTIES BE RESPONSIBLE OR LIABLE FOR ANY DAMAGES OR LOSSES OF ANY KIND, INCLUDING DIRECT, INDIRECT, INCIDENTAL, CONSEQUENTIAL OR PUNITIVE DAMAGES ARISING OUT OF YOUR PARTICIPATION IN THE SWEEPSTAKES OR ACCESS TO OR USE OF THE PRIZE. IN NO EVENT SHALL THE RELEASED PARTIES’ TOTAL LIABILITY TO YOU FOR ALL DAMAGES, LOSSES, OR CAUSES OF ACTION EXCEED THE PRIZE VALUE. WITHOUT LIMITING THE FOREGOING, THE SWEEPSTAKES AND ALL PRIZES ARE PROVIDED “AS IS” WITHOUT WARRANTY OF ANY KIND, EITHER EXPRESS OR IMPLIED, INCLUDING BUT NOT LIMITED TO, THE IMPLIED WARRANTIES OF MERCHANTABILITY, FITNESS FOR A PARTICULAR PURPOSE OR NON-INFRINGEMENT. SOME JURISDICTIONS MAY NOT ALLOW THE LIMITATIONS OR EXCLUSION OF LIABILITY FOR INCIDENTAL OR CONSEQUENTIAL DAMAGES OR EXCLUSION OF IMPLIED WARRANTIES SO SOME OF THE ABOVE LIMITATIONS OR EXCLUSIONS MAY NOT APPLY TO YOU. CHECK YOUR LOCAL LAWS FOR ANY RESTRICTIONS OR LIMITATIONS REGARDING THESE LIMITATIONS OR EXCLUSIONS. Notwithstanding the foregoing, in the event that the preceding release is determined by a court of competent jurisdiction to be invalid or void for any reason, each Entrant agrees (except where prohibited) that, by entering the Sweepstakes, (a) any and all disputes, claims, and causes of action arising out of or in connection with the Sweepstakes, or the prize awarded, shall be resolved individually without resort to any form of class action; (b) any claims, judgments and awards shall be limited to actual out-of-pocket costs incurred, including costs associated with entering the Sweepstakes, but in no event attorney’s fees; and (c) under no circumstances will any Entrant be permitted to obtain any award for, and each Entrant hereby waives all rights to claim, any punitive, incidental or consequential damages, and any and all rights to have damages multiplied or otherwise increased, and any other damages other than damages for actual out-of-pocket expenses, if any. Force Majeure: Without limiting any other provision in these Official Rules, the Released Parties are not responsible for or liable to any Entrant or winner, or any person claiming through such Entrant or winner, for failure to supply the Prize or any part thereof due to any Sweepstakes activity or being affected, as determined by Sponsor in its sole discretion, by reason of, without limitation, (a) any acts of God; (b) any law, rule, action, regulation, order or request by any local, state or federal governmental or quasi-governmental entity or authority (whether or not the law, rule, action, regulation, order or request proves to be invalid); or (c) any other cause beyond the reasonable control of the Released Parties, whether or not specifically mentioned above. Your Entry: By entering the Sweepstakes, Entrant agrees to indemnify, defend and hold harmless Sponsor, its respective subsidiaries, affiliates, directors, officers, employees, attorneys, agents and representatives, from any and all third party liability for any injuries, loss, claim, action, demand or damage of any kind arising from or in connection with Entrant’s entry. Use of Winner’s Name, Likeness, etc. : Except where prohibited by law, entry into the Sweepstakes constitutes permission to use any winner’s name, email address, likeness and/or prize information, without limitation, for promotional purposes without further permission or compensation. As a condition of being awarded any prize, except where prohibited by law, winners and, if applicable, their guests may be required to execute a consent to the use of their name, address, likeness and/or prize information, without limitation, for promotional purposes without further permission or compensation. Affidavit & Release: As a condition of being awarded any prize, winners and, if applicable, their guests may be required to execute and deliver to Sponsor a signed affidavit of eligibility and acceptance of these Official Rules and release of liability. 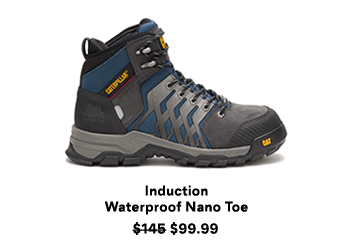 Winners List: For a copy of the winners list, write to “Attn: Desk Giveaway Sweepstakes, Cat Footwear” at 9341 Courtland Drive NE, Rockford, Michigan 49351 after February 28, 2019 requesting the same. Miscellaneous: The Sweepstakes and these Official Rules will be governed, construed and interpreted under the laws of the State of Michigan. Sponsor reserves the right to change these Official Rules at any time, in its sole discretion, and to suspend or cancel the Sweepstakes or any Entrant’s participation in the Sweepstakes should viruses, bugs, unauthorized human intervention or other causes beyond Sponsor’s control affect the administration, security or proper play of the Sweepstakes or Sponsor otherwise becomes incapable of running the Sweepstakes as planned, as determined in its sole discretion. Sponsor reserves the right to disqualify persons whose eligibility is in question or who Sponsor, in its sole discretion, otherwise deems ineligible to enter the Sweepstakes. If you have any questions about these Official Rules or the Sweepstakes, please write to “Attn: Desk Giveaway Sweepstakes, Cat Footwear” at 9341 Courtland Drive NE, Rockford, Michigan 49351 indicating the same. 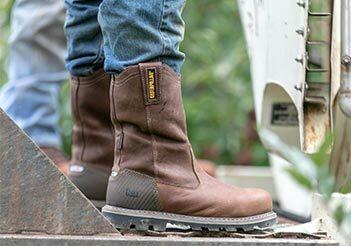 Copyright Notice: The Sweepstakes and all accompanying materials are copyrighted © 2019 by Cat Footwear, a division of Wolverine World Wide, Inc. All rights reserved.